Digital literacy looks beyond functional IT skills to describe a richer set of digital behaviours, practices and identities. What it means to be digitally literate changes over time and across contexts, so digital literacies are essentially a set of academic and professional situated practices supported by diverse and changing technologies. This definition quoted above can be used as a starting point to explore what key digital literacies are in a particular context eg university, college, service, department, subject area or professional environment. Literacy is about development so understanding digital literacy in this way is important; we acquire language and become increasingly proficient over time and eventually reach a level of fluency. 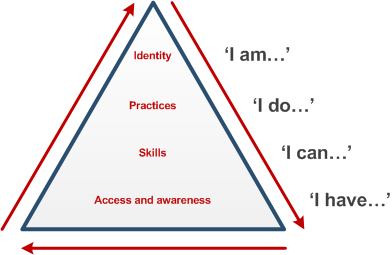 Beetham and Sharpe’s framework (2010) describes digital literacy as a development process from access and functional skills to higher level capabilities and identity. However, this will change depending on the context so it also reflects how individuals can be motivated to develop new skills and practices in different situations. A number of institutions have adapted and used the framework in their digital literacy projects. This and other models are useful tools for raising awareness and engaging stakeholders in discussions around digital literacies to develop a shared understanding and goals. They also have a practical application to help map how these might be developed, supported and evaluated. 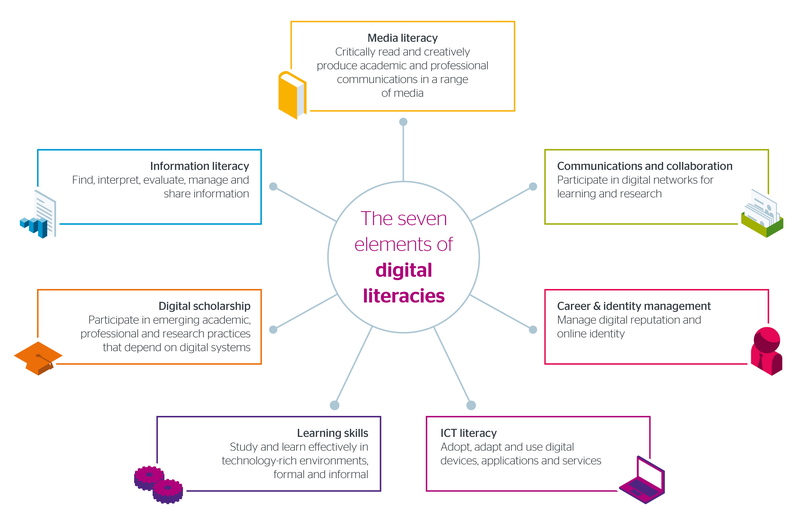 The Jisc Developing Digital Literacies programme (2011-2013) set out to explore institutional approaches to digital literacy development in universities and colleges. The 12 institutional projects and 10 professional associations involved worked across a range of stakeholder groups: students, academic staff, teachers, researchers, librarians, administrators, technical staff, support staff and senior managers. The knowledge and resources from the programme have been shared progressively through the Jisc Design Studio. This detailed guide draws on this to provide a set of practical guidance, tools and approaches. It examines the ‘top down’ strategic considerations involved in developing digital literacies across an institution as well as an ‘on the ground’ view of what this means in practice. Feedback We would love your feedback on this detailed guide. Complete our survey now.